School is BACK as is the routine of packing lunches each day and wondering what’s going to get eaten right? To give you some inspiration we turned to some of our favourite foodie parents and carers to get the scoop on what’s going into their kids lunches and snacks AND (the big bonus) they’re handing over their secret recipes too! 2. Add all ingredients to a food processor and blitz for a a few minutes until the mixture comes together. “I have has 2 beautiful nieces (Isabella – 12 and Sarah – 8) that are at school and my sister is always on the lookout for quick, yet nourishing lunches to pack for them. This chicken quinoa is one of their favourite lunches and one that my sister can prepare in no time. Quinoa with chicken, mixed herbs and a nut-free pesto (Nut-free pesto is simply basil, avocado, lemon juice, olive oil, salt & pepper all blended together. Chicken is poached, as I find this the quickest and with the least amount of mess to clean up. If you have any leftover chicken from dinner, you can use that). This can all be prepared in 30-40 minutes on a Sunday but will easily cover 3 lunch days. 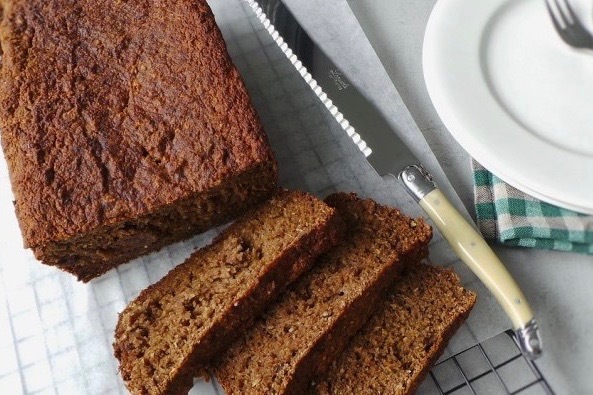 + I don’t know too many kids that don’t enjoy a slice of banana bread, so this nut-free recipe is great for a lunchbox snack or as an after school treat. The teff flour gives it a nutty flavour without the nuts. • If you’re using honey, maple syrup or stevia, you can avoid using a blender or food processor. Simply start by mashing the bananas in a large bowl, and then add the honey/syrup/stevia as well as the eggs and coconut milk before adding the other ingredients. What’s in her kids lunchbox…. Leftover dinner veg with hummus. Sambo on grainy bread with cream cheese. RECIPE : Hummus with whatever you are trying to get your kids to eat- sneak extra veggies into it, blend with white bean or chick pea, lemon, olive oil, tahini, paprika. Call it something crazy that they might love (like ninja turtle dip) and who knows, they just might eat those veggies! We think you’ll love this recipe for @brownpapernutrition Beetroot Dip – plenty of kids do! I always have a mixture of healthy, fresh, real food. There will always be good fats, protein, fibre, healthy carbohydrates and a homemade healthy treat to meet their nutritional requirements and nourish their growing bodies. I try to avoid package foods and provide seasonal foods. Spread each pastry sheet with 3 tablespoons of pizza sauce, sprinkle with Italian herbs and diced ham. Spread the pizza cheese over the top. Roll each pastry sheet tightly into a scroll and slice the scroll evenly into 12 pieces. What’s in my kids lunchbox? 100% Corn Tortillas. You could also put some sourdough, gluten free bread or a wrap. If your kids are older (and hungrier), you could add some whole milk yogurt and cheese and of course increase portion size. I always try to give the kids protein, some vegetables (although they don’t always get eaten), a carb such as sourdough, brown rice or brown rice pasta, tortillas or wrap and some fruit. If it isn’t a sandwich or a wrap, its a deconstructed one (pictured). I find my kids always eat better with a ploughman’s style lunch as they can see, pick and choose (or discard!) what they like. 500g organic chicken (i use thigh as it’s higher in iron). You could also use beef, lamb or pork. 1 cup of mixed grated/finely chopped vegetables (i used corn and zucchini). You could also use some grated apple and carrot, if you like your meatballs a little sweeter. Handful of parsley, coriander or chives, fine chopped. Place chicken in a food processor and blitz until you create mince. Add vegetables, garlic, herb/s, onion, egg and crumbs or polenta to food processor and blitz again for 10 secs or until combined. gelatin gummies great for tummies… the jingle whilst packing these is key! cherry tomatoes, capsicum on the side and a morning tea from the above selection above. For the most part there is a balance of plant based proteins, carbs and fats in Jet’s lunch. However some days, lunch and morning tea are definitely higher in carbs and it’s on these days I focus on a protein rich breakfast before school, and arriving at pick up with cooked protein for a snack – lamb chops always win, but chicken drumsticks, boiled eggs or hummus with veggies also go well. Dinner is always well balanced with the macros – protein, carbs, fats too.